A delicious, all natural topping to help you stay healthier! 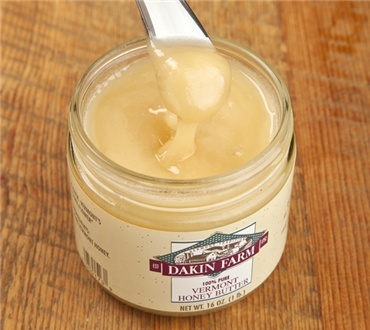 At Dakin Farm we call it Honey ButterÂ because it is a creamy, smooth, spreadable form of honey. In fact, it is really raw honey extracted directly from Vermont beehives by our local beekeeper. Raw honey has not been heated and filtered which lessens the natural nutritional value of honey. So, not only is it creamier and more spreadable than clear honey, it is also better for you and more full flavored. Our organic, raw Vermont honey is packed with vitamins, amino acids, and digestion-aiding enzymes. It is a natural antioxidant, anti-inflammatory and it aids digestion. Best of all, is the incredible flavor it adds when spread on toast, English muffins, in tea or anywhere you would like to add the sweet goodness of all natural honey to what you eat or drink in good health. It's creamy & honey-y. What more can one say? It's awsome on English muffins. I ordered 3 jars and 2 of the 3 jars had leaked. The jars were all sticky and so was the paper they were wrapped in.Granted the honey butter was only on the jars and paper they were wrapped in. This will be a repeat order for me; the honey is the most flavorful of the North East honeys. There is nothing in the south that can compare. I wasn't sure what this way but am thrilled with it now.i have tried different ways and are not done trying it cooking tasting and putting it into recipes.